Tens of thousands of people have been killed as Yemen's brutal war enters its fifth year this week, with no end in sight. Bombs from air raids have killed or injured an average of 37 children every month for the last 12 months, according to Save the Children. An estimated 85,000 children under five may have died from extreme hunger since 2015. Air strikes have been the leading cause of war-related deaths and injuries among Yemeni children, according to the charity. The conflict pits the Iran-aligned Houthi movement against Yemen's Saudi-backed government. Here are eight facts about the war that has created the "world's worst humanitarian crisis", according to the UN. 1. More than one third of Yemenis, or nearly 10 million people, cannot find enough to eat. 2. An estimated 85,000 children under five may have died from extreme hunger in since 2015. 3. About two million Yemeni children are malnourished, with 360,000 of them suffering from "severe acute malnutrition". 5. Nearly 18 million Yemenis lack access to clean water. 6. More than 190,000 people have fled to neighbouring countries. 7. About two million children in Yemen are out of school. 8. Some 1.2 million suspected cholera cases have been reported since 2017, with more than 2,500 deaths. Why is the war taking place? Today's conflict is extremely complex and dates back many years, but its more recent roots were sown during the Arab Spring movement of 2011. Protests against the rule of long-term President Ali Saleh led to splits in the army, allowing Al Qaeda in the Arabian Peninsula to seize swathes of territory in the east. President Saleh stepped down and, in a political transition plan backed by Gulf states, he handed power to his deputy Abd-Rabbu Mansour Hadi, who became interim president. But former President Saleh, who retained the loyalty of some security personnel, tried to undermine this political transition. In 2014 Mr Salah lent support to his old enemies, the Houthi rebels. They advanced from the south of Yemen and seized the Yemeni city of Sanaa on 21 September and demanded a share in power. In 2015 Mr Hadi tried to announce a new federal constitution, but this was opposed by the Houthis and Mr Saleh, who arrested him. Mr Hadi fled abroad in March 2015. This triggered Saudi intervention. Along with a coalition of other mostly Sunni Arab states, Saudi Arabia began air strikes aimed at restoring the Hadi government. Months later, that coalition drove the Houthis and Mr Saleh loyalists from Aden in south Yemen and Marib, northeast of Sanaa, but the front lines solidified, setting up years of stalemate. In 2016 Al Qaeda, in the Arabian Peninsula, took advantage of the chaos to establish a mini-state around Mukalla in east Yemen, raising fears of a new surge in jihadist activity. 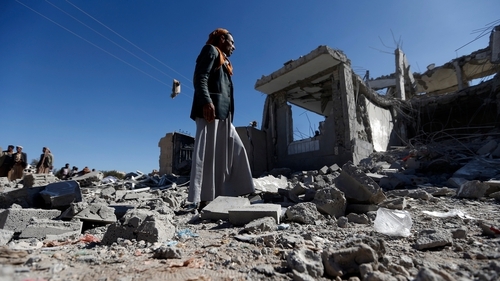 Hunger grew as the coalition imposed a partial blockade on Yemen and accused Iran of smuggling missiles to the Houthis through the key port of Hodeidah, alongside food imports - something that Iran denied. Coalition air strikes have killed thousands of civilians, prompting warnings from rights groups, but western support for the military campaign has continued. In 2017 the Houthis launched a growing number of missiles deep into Saudi Arabia, including at Riyadh. Seeing a chance to regain power for his family by reneging on his Houthi allies, Mr Saleh switched sides, but was killed trying to escape. In 2018 coalition-backed forces, including some flying the southern separatist flag, advanced up the Red Sea coast against the Houthis, aiming to take the port of Hodeidah, the last main entry point for supplies into north Yemen. Earlier this year, the United Nations renewed its efforts to end the Yemen war under a peace plan that calls for a ceasefire between the Saudi-led coalition and Iranian-aligned Houthi insurgents. What is the role of the west? In Germany, Chancellor Angela Merkel's cabinet is currently considering whether to extend an arms sales freeze on Saudi Arabia that has impacted other European exports. Berlin imposed the moratorium on countries involved in the Yemen war in October following the murder of Saudi dissident journalist Jamal Khashoggi in Istanbul. The move angered both Paris and London because of its knock-on effect on common European defence exports, and French President Emmanuel Macron labelled Berlin's call for other countries to follow suit as "pure demagoguery". This week, leaders of Britain's five main opposition parties called on the UK government to halt arms sales to Saudi Arabia for use in the war in Yemen. The letter, signed by Labour's Jeremy Corbyn and the SNP's Ian Blackford, calls for an end to British military operations in the kingdom and condemns Riyadh's conduct in the conflict. Yemenis held a mass rally in Sanaa today to show support for the Houthi movement and to coincide with the fourth anniversary of the war. Massive speakers played "America and Israel, death and mutilation to you" and "five or 50 years, we will face the criminal coalition". Meanwhile, security officials say fighting has again erupted in the key port city of Hodeidah, killing at least eight people, including civilians. The United Nations is scrambling to salvage the ceasefire deal in the Yemeni port city that is a lifeline for millions at risk of starvation. The clashes were the heaviest since the ceasefire went into effect on 18 December, residents said, and came as the United Nations announced a deal setting out details of a mutual military withdrawal envisaged by the Stockholm truce accord. Roofless and living in a makeshift home, Ahmed Ghaleb and his six children have been forced out of their home due to the increased fighting in Hodeidah. Originally a shopkeeper near Hodeidah's corniche, Mr Ghaleb is a father of one boy and five girls who suddenly saw business stop at his store and a landlord asking for rent, which he could no longer afford. Father to a 19-year old daughter who suffers from atrophy, he is now unable to sustain his family or provide the necessary medication for his ailing daughter. The father took his family and moved north of the city close to Hodeidah port, to a neighbourhood of improvised homes made of steel sheets and straw roofs, which houses internally displaced families. He now relies on construction jobs in his new neighbourhood in return for whatever income is available in order to be able to put food on the table for his family. Mr Ghaleb is forced to undertake a daily trip so he can get clean water for his family to drink, in an area that lacks even the basic necessities for survival such a sewage system and running water.